By now you know the meat n’ potatoes of the whole series: Hawkeye’s hunkered down in unstable southeastern Asia, trying in vain in track down a Super Soldier serum recipe while avoiding The People, some super-patriots who are all about toppling the existing government and inserting and asserting themselves as the Powers That Be. Oh, and they also want to exterminate all of mutantkind. Kinda important footnote. Here in issue #3 of the four issue mini, we join up with Hawk and the gang, one of which is The Hulk, so you see where this is heading. The way they have it figured is if the gang sneaks into the enemy fortress unnoticed and “steal” the plans telepathically, no harm’s done. “Hulk” and “covert” are practically antonyms, so there’s plenty of resulting property damage until a mystery man sends the big grey mass down to his knees. Yeah. Meanwhile, Hawkeye and the squad find out what they want to steal might be practically given to them by another shadowy figure. Might’s the keyword, so there’s gotta be a catch, and rest assured you’ll catch it in November’s final issue. On the good side, everything remains the same: Hickman moves the story along well, dashes of action throughout. 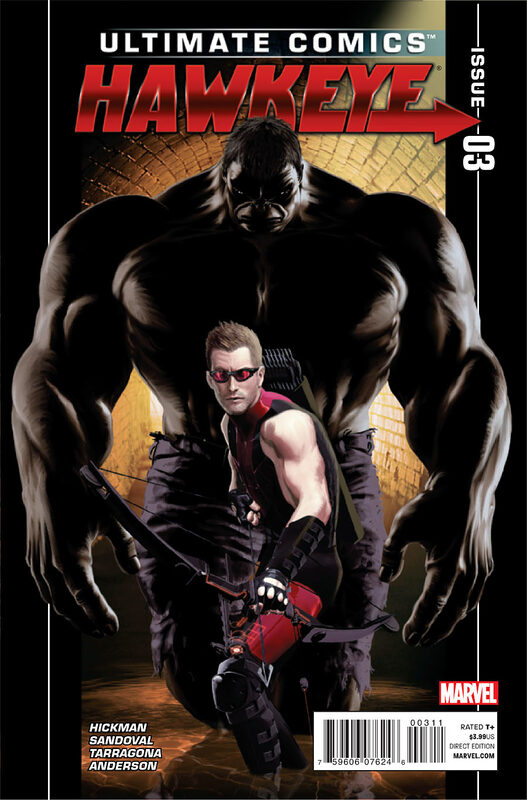 On the bad side, I’m still not a huge fan of artist Sandoval’s Hawkeye; instead of a former Olympic archer, he looks like steroidal boy-band member with facial expressions that him look like he’s always chewing gum. Gum he doesn’t particularly care for, either. When he’s not looking that way, he wears a “who farted” grimace. Otherwise, everything looks presentable, especially backgrounds, something I feel is one of Sandoval’s strengths. 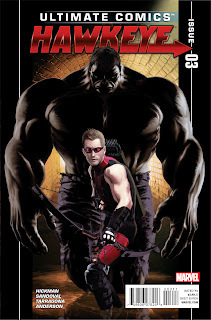 One thing to nitpick and I’ve never mentioned in the reviews of the two previous issues, but in the book Hawkeye uses a recurve bow; in the excellent covers by Kaare Andrews, he’s using a tech-heavy compound which looks as cool as all get out. The latter better suits the “ultimate” style of the character’s all I’m saying. Not the best issue in the series (so far) but still a vital piece to the overall storyline. Brian Cee is a contributing writer for Champion City Comics.